It was a conscious decision to take a metro ride so I asked the auto wallah to take a detour to the nearest metro station instead going directly to ISBT(Delhi’s Inter state Bus Stand). The nearest metro station happened to be Central Secretariat. At an intersection the road on the left looked very familiar and so did the buildings at the end of the road. Another semicircular building hid behind trees in the north-west direction. I have never had a chance to see the power hub of India at close quarters and this was an opportunity not to be missed. 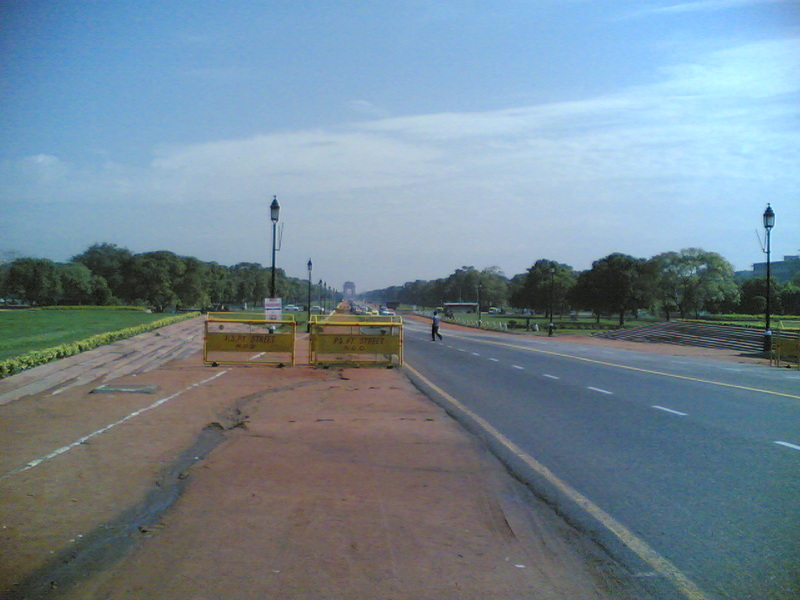 So I started moving on the familiar road I had seen earlier – the one which we see every 26th January – Rajpath. 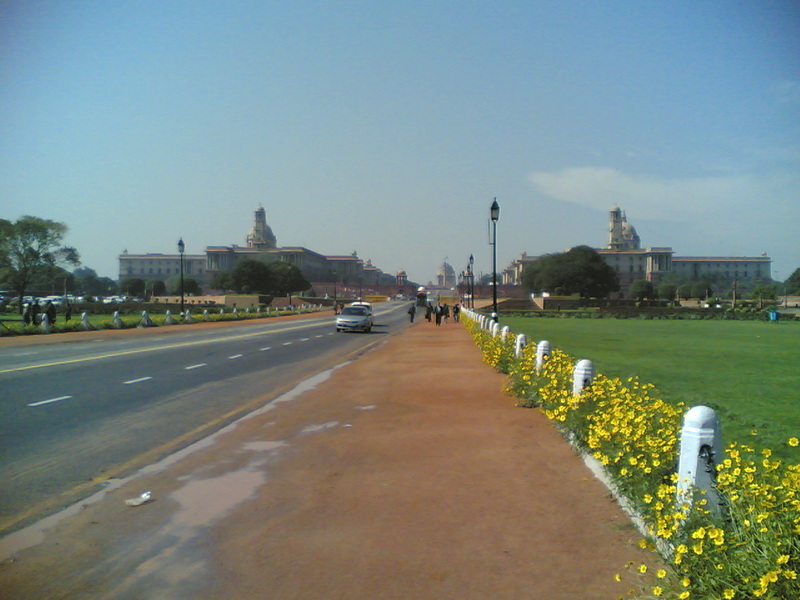 The two colossal structures – South Block and North Block, looming large ahead. To the right was the Parliament House. I clicked some photos. 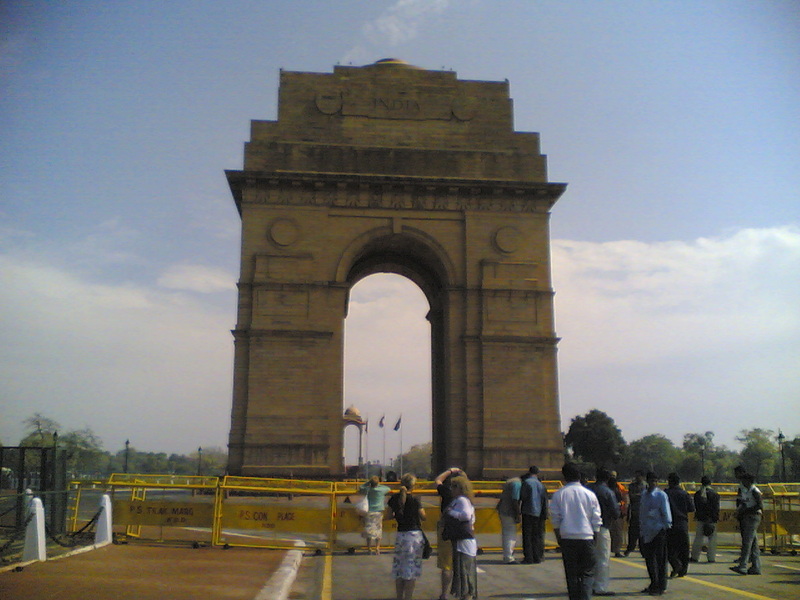 And as I turned around to come back – there was the India Gate standing distinctly far down the road. Amazingly when I told one of my friends about this, the prompt question was “you must be thinking of RDB!!!”. Well, Miss T, either you can read minds or I am obsessed about RDB and everyone knows it.. because that was the first thought the came to my mind – the masti ki pathshala song where they circle the India Gate. I walked some 2 – 3 kilometers to reach the famous 42 meter high monument with names of all the Indian WW 1 and Afghan War martyrs inscribed on it. It was a transformation from the history to the future – the Metro trains. As soon as you step on to the stairs going down to the underground station (there are many stations on ground level too but I experienced the underground one), you are into a different world altogether. Sparkling clean floors & platforms, close circuit cameras all around, automatic gates and of course the metro train itself. It is a different world down there. But as soon as you step off the stairs again and enter ISBT – it is the normal story again – filth, garbage all over. The metro was host to all – literate and illiterate so the argument that it is the uneducated ones who are responsible for all the filth is wrong. If one sees cleanliness, he is motivated to maintain it and feels ashamed at spoiling it. I hope the metro effect spreads everywhere. >hmm… well I can recall my metro experience too because of this post….. I landed up at NDLS and had to go to a frnds house which otherwise would have taken 1-2 hours and I had no experience of metros.But I decided to use it and then went to metros. The best thing was the information boards that they’ve put up are so helpful that one needn’t ask anyone. You can make out things on your own… I too was able to and it was an excellent experience….and it would be good to know that metros in UK too are similarly fashioned… not one thing is different… I mean even the cleanliness levels and abundance of sign boards…. >Hey mr G,I guess i will prefer ‘being able to read mind’ padvi more he he! :)nice pics yaar..Delhi looks amazing in there..
>@fleiger: plzzzzzzzzzz tell me the source of those 20 tracks!!! >@KT: glad to know that we are slowly becoming at par with the global standards… and u r ryt.. the info boards were in abundance.. i made the mistake of asking a person before boarding abt the stop etc.. he said u wud come to know… no prob.. and it indeed was no prob at all.. all very explicit..@ Miss T: as discussed ‘padvi’ given ;)@fleiger: Thanks!! >@anon: asli AIR ho bhi nahi sakta tha RDB mein… vele thodi na hain AIR wale!!! @cuckoo: ?? ?